In like a lion and out like a lamb, so they say March goes at least. In DC, March has certainly come in with a lion-like roar of 70 mph winds, sun, rain, snow and flowers- yes, all in a week's time. March brings a lot of emotions for me. I cheer the flowers' growth while lamenting the snow, but also wistfully appreciating the last flakes before the spring + summer. It's a complicated time with transitional weather that dramatically changes day to day. There's an anxious anticipation of spring, and a lot of airy vata energy (for the yogis in the back). This month's candle subscription is to help combat all those feelings and help you settle, ground, and patiently await spring. This month's scent, lavender vanilla, is soothing and sweet. It's restful but won't put you right to bed. It's grounding, settling, and helps slow down your emotions while you're watching the flowers bloom. 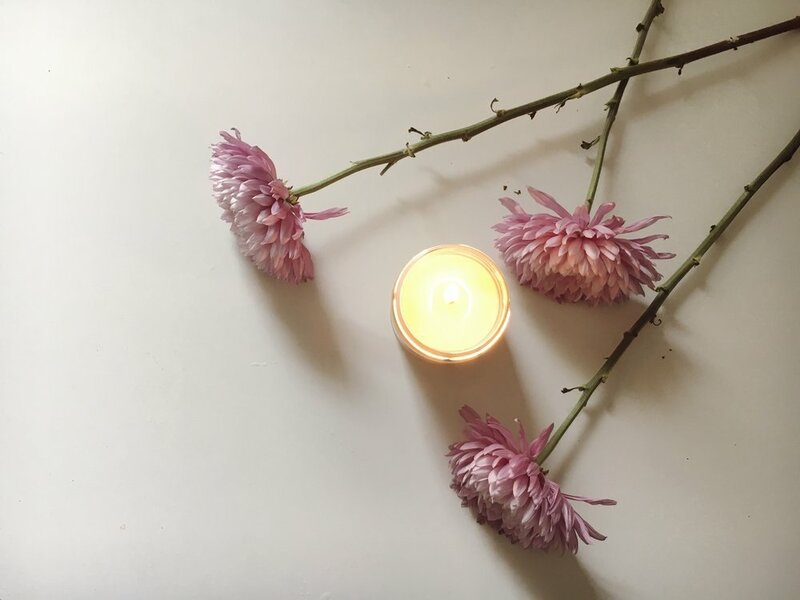 This month's candle subscription also came with a little lavender spray, which makes a perfect light touch to your sheets before bed, to your face during Savasana, or to a bath on a Sunday. We've made this exclusively for our candle subscribers for now, so subscribe to this month's box if you'd like one for yourself! This winter has felt long to me, and to help get through that I've been getting reacquainted with my local library. I use it as a way to test drive books that I want to add to my collection. Currently I have my nose in Rupi Kaur's the sun and her flowers, a fitting start to the spring season, I thought. The countdown is on to spring! How are you spending these last few weeks of hibernation? Snuggled up with blankets? Enjoying tea? Getting your ice skating in? Let us know, and tag your subscription on instagram #HHCandleSubscription!